Ep 142 - No Spoilers! On today's show Mike and Robbie talk about kids making slime, Mike got dressed up and it didn't go smoothly, people who enjoy spreading spoilers, plus their drinks, snacks and much more! This week Mike and Robbie announce that one of them is now ordained, discuss beer in supermarkets, watching movies with Mike's daughter, speaking at career days, Avengers: Endgame and Robbie tells us about his trip to Wrestlemania. Plus their drinks, snacks and much more! The boys are back! Mike and Robbie are joined by George Mac to discuss Mike's surgery and recovery, Avenger's Endgame, the new Joker movie, along with their drinks, snacks and much more. The 222 Podcast is sponsored by... Klingers Pubs. Get on over to KlingersPubs.com for more info about Klingers on Carsonia, Klingers of Fleetwood and Kingers at the Airport. Plus, make sure to like all three locations on Facebook. Hey 222ers, Mike is still on the mend, but new Eps are coming soon! So catch up or listen to some old Eps as we take this short break. 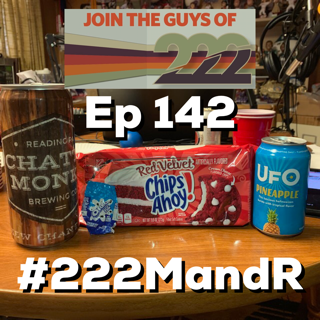 Mike and Robbie are back in the 222-dio to talk about friend requests, the last month of shows, anticipated movies and escape rooms, along with their drinks, snacks and much more. 222 are back for more fun on the latest Ep of 222! This week the guys talk about keeping Christmas lights up, they might be losing their minds, being out after 10pm, slang words, plus their drinks, snacks and much more. George Mac is back with Mike and Robbie for some more 222 fun! This Ep they delve into pre-show activities, Facebook messenger and Bird Box, along with their drinks, snacks and much more. Dan Neubert is back with M&R to talk about that pickles are in fact cucumbers, dreams, one of our ads, the Titan Games, along with their drinks, snacks and much more. The boys are back in the basement studio and this week they're joined by George Mac to talk about at technical issue, TV commercials, some of the items that were on display at the CES, a cracker eating controversy, along with their drinks, snacks and much more. Another week, another Ep of 222! Mike and Robbie are joined by Dan Mc to talk about the first full week back to work after the holidays, blocking "friends" on social media, sneaking food into places, Mike received some interesting medical paperwork, along with their drinks, snacks and much more.